We’ve been in the green industry long enough to know that absolutely no residential landscape is the same — every landscape vision we create is unique to an individual homeowner, our customer. 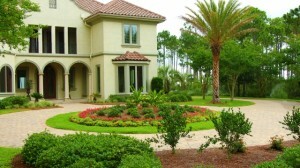 In fact, great landscaping will actually enhance your property value, so your investment will actually pay off in the end! If you are looking for help with your outdoor living space, we provide residential landscape installation, design, maintenance, irrigation, hardscape, and lighting services.Use the links to the right to learn more about the wide array of residential landscaping services we offer. Already itching to get started? Let’s get to work! Give GreenEarth Landscape Services a call at (850) 236-1959 (Panama City Beach) or (850) 267-0010 (Santa Rosa Beach), or fill out our handy online form to schedule a free consultation. If you need some inspiration, download our handy Landscape Planning Guide by clicking on the image below. GreenEarth has been a pleasure to work with, and you all provide a service that is an excellent value. I will be glad to recommend your company to anyone wanting quality care.